It is incredibly easy to forget the combination to padlocks on your own tool shed, gym locker or anyplace else these common locks are found. This handy, no-frills guide teaches you one thing and one thing only: how to open a padlock whose combination is forgotten, lost or garbled. 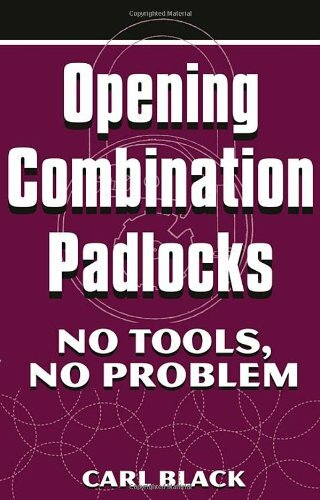 Dissatisfied with existing books on padlock manipulation whose shortcomings caused a lot of useless and time-consuming effort, author Carl Black devised this foolproof system that allows quick entry into all combination padlocks without any guesswork or tools. He explains the tricks of the trade with clear instructions and illustrations and includes troubleshooting tips for difficult locks. Apply this simple method and determine the combination of any padlock in minutes. For academic study only. 5.5 x 8.5, softcover, illus., 64 pages.